Hundreds of Venezuelans have requested asylum in Peru, an official has said, just hours after the country tightened its entry requirements. New rules require Venezuelans trying to enter Peru to have a passport, and not just an identity card as before. Similar regulations were introduced in Ecuador last week, only to be overturned by a court. Tens of thousands of Venezuelans are fleeing their country amid chronic shortages of food and medicines. The country's longstanding economic crisis has seen more than two million citizens leave since 2014, causing regional tensions as neighbouring countries struggle to accommodate them. Like other South American nations, Peru is trying to control the influx of people escaping Venezuela's economic crisis. The UN - whose migration agency has warned that the continent faces a refugee "crisis moment" similar to that seen in the Mediterranean in 2015 - is setting up a special team to co-ordinate the regional response. What is happening in Peru? The authorities in Lima set a deadline of midnight on Friday for the new passport rules to come into force. Many Venezuelans have been looking to start a new life in Peru - which has one of the region's fastest growing economies - travelling there via Colombia and Ecuador. On Friday there was a rush of people heading to the Peruvian border and Ecuador created what it called a "humanitarian corridor" by laying on buses to take migrants through the country. Peruvian Prime Minister César Villanueva said requiring Venezuelans to show their passport at the border did not mean that Peru was "closing the door" to migrants. He said ID cards did not provide enough information and could easily be forged. Citizens of most South American nations can visit countries in the region without needing a visa or even a passport. The Andean Community trading bloc - which includes Ecuador and Peru - also allows visa and passport-free travel for its citizens, although Venezuela withdrew from the grouping in 2006. Peru is already home to about 400,000 Venezuelan migrants, most of whom arrived in the past year. On Friday, more than 2,500 crossed into the small Peruvian border town of Aguas Verdes, with thousands more trying to reach Peru at the main crossing point at Tumbes. The Tumbes crossing has seen about 3,000 arrivals per day in recent weeks. Throughout Friday evening Venezuelans kept arriving, many in government-commandeered buses that had brought them from the Colombia-Ecuador border. It was called a humanitarian corridor but, of course, it was one that was in Ecuador's interests, too. They didn't want to be left with stranded Venezuelans once midnight had passed. 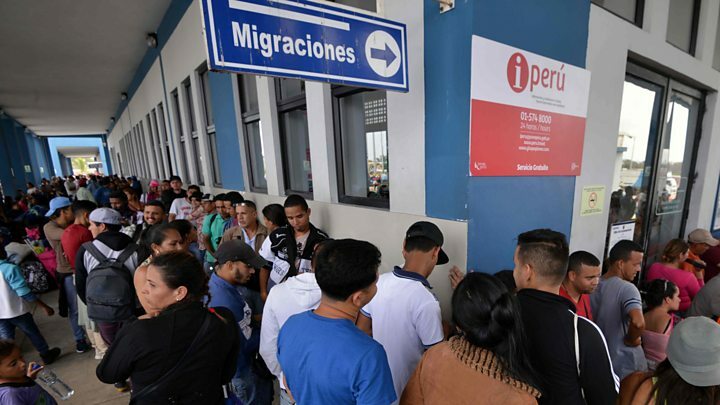 With less than 10 minutes to go before the deadline, there were more than 100 people with no passports waiting in the queue hoping to be allowed into Peru. Migration officials handed out a small pink ticket to those lining up. Those who were in the queue before midnight would be allowed to cross the border. Anyone else arriving after midnight would not. A seemingly insignificant piece of paper but one that would define the future for these Venezuelans heading to Peru to find work. Joel Millman, a spokesman for the International Organization for Migration (IOM) - a UN agency - said increasing border restrictions coupled with an outbreak of violence on the Brazilian border last week, was an early warning sign that the region was in need of help. "This is building to a crisis moment that we've seen in other parts of the world, particularly in the Mediterranean," he told reporters. Chiara Cardoletti of the UN's refugee agency (UNHCR), said other countries in the region had welcomed Venezuelans and were helping to "avoid a situation like the one we have seen in Europe". "What we are seeing is a continent that has opened its doors to people who are fleeing and who need support," she told the BBC. Ms Cardoletti added that Colombia had registered more than 450,000 Venezuelans and given them regular status. 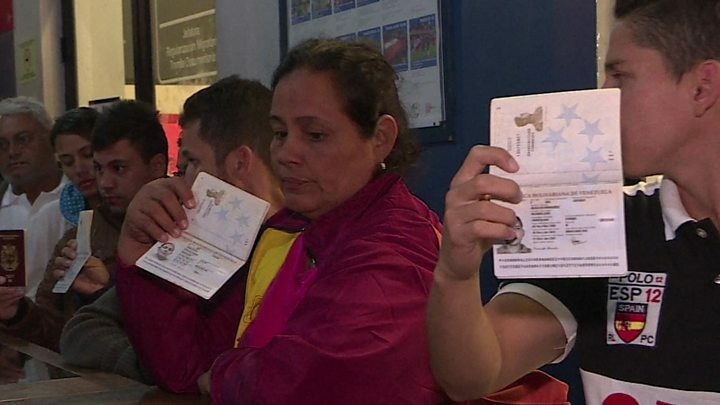 Ecuador brought in new passport regulations last week, leaving hundreds of migrants stranded on it border with Colombia. However, on Friday, a judge found that requiring Venezuelans to carry valid passports broke regional agreements on freedom of movement. More than half a million Venezuelans have crossed into Ecuador this year alone and more than a million have entered Colombia in the past 15 months. Brazil's northern state of Roraima has also had its attempt to close the border with Venezuela thrown out by a judge. Violence erupted in the border town of Pacaraima last week when local residents attacked makeshift camps housing Venezuelan migrants. The camps were burned down and the occupants temporarily fled back across the border. Despite the violence, the number of Venezuelans crossing daily into Brazil has continued to rise. The government took drastic measures to stabilise the economy last week, issuing new banknotes that slashed five zeros off the bolívar. Runaway inflation had been predicted to hit one million per cent by the end of the year. On Friday, Venezuela's information minister Jorge Rodriguez said the measures would persuade those Venezuelans who had left to return. Economists have warned that the new measures do not address the root causes of inflation in Venezuela and that the printing of new notes could exacerbate inflation rather than curb it. Video Venezuela crisis: Why has 7% of the population fled the country? Venezuelan bolivar - what can it buy you?